Two people are recovering from carbon monoxide poisoning after a car was left running for hours inside of the garage of a Gardner, Kansas, home. GARDNER, Kan. — Two people are recovering from carbon monoxide poisoning after a car was left running for hours inside of the garage of a Gardner, Kansas, home. According to the Fire District No. 1 of Johnson County, a woman who lives at the house called for help around 10:30 p.m. on Saturday. "(She) was having a difficult time speaking, said she felt dizzy and didn't think she could get up," Battalion Chief Rob Hudspeth said. First responders found two victims. one at the bottom of entryway stairs and the other in an upstairs living room. 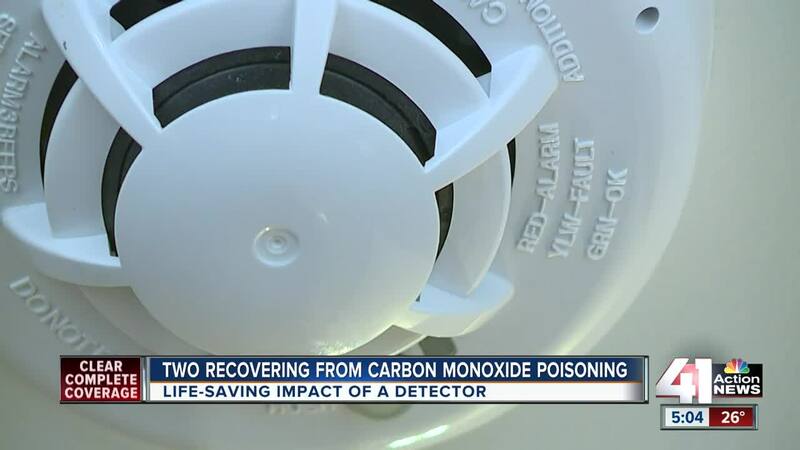 The residents did not have a carbon monoxide detector, but the fire crew's carbon monoxide readers were reading more than 500 parts per million. "Survivability in that can be very difficult," Hudspeth said. "Over 100 parts per million is dangerous to human life." Luckily, emergency crews were able to rescue both victims. They then aired out the house to clear any remaining carbon monoxide. A similar incident happened a couple weeks ago at Ben Rao's building in Lee Summit. "In the slumber at 3 o'clock in the morning and alarms start going off throughout the entire house," Rao said. Thankfully Rao had multiple carbon monoxide detectors in his building and he immediately ran downtstairs to find the Lee Summit FIre Department right outside. "They were here for over 2 hours, we were looking for it they had their detectors, we aired the whole place out, we're trying to figure out where it's coming from and we can't find it," added Rao. The fire department with the help of Spire turned off all the gas but the source was from a flower shop next door. "They had an old boiler and it was just blowing out carbon monoxide in the entire place," said Rao who is thankful to be alive and glad his detectors saved his life, "Thank goodness we had this at 3 o'clock in the morning, who knows another 4 hours of that going on we might not have woke up". Detectors can cost anywhere from $10-$20 dollars a store. The gas does not have a smell and you can't see it. It's deemed the 'silent killer'. If you are feeling nausea, dizziness in your house call 911.